Preamble: The recent egregious decisions by activist Federal judges halting Trump's legal Executive Order issued pursuant to 8 USC 1182(f) that temporarily bans individuals from seven countries well known to be closely tied to terrorists from entering America were an outrageous abomination of justice. These judges willfully violated the U. S. Constitution, disgraced America, and impugned the judiciary. It is abundantly clear that their biased opinions were based on personal ideology far removed America's best interests and her laws. 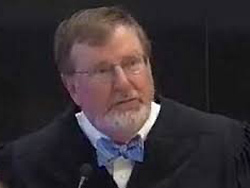 Prior to beginning this blog, I must point out the Federal District Court judge who halted Trump's legal ban is the dishonorable James Robart out of Washington State. His decisions consistently evince an ugly pattern of being anti-law enforcement while actively advocating for illegal aliens, Muslims, and BLM thugs. Trump's Constitutional Authority: In issuing the subject ban Trump's Executive Order tracked and cited the verbiage of 8 USC 1182 (f) verbatim. This statute, set forth below, vests the president with the absolute authority to suspend the entry of aliens or any class of aliens for national-security purposes for any period of time that he deems necessary. It is crystal clear that Trump's Executive Order was legal pursuant to the applicable statute and should have never been halted. It is also clear that each decision was made by radical activist liberal judges that knowingly ventured from their domain of interpreting and applying the law into verboten territory of legislating for their own self interests. The net effect of their intentional reckless self-serving decisions was to wrest the exclusive power vested in the President under 8 USC 1182 (f) and vest it in themselves. As a matter of record, the Supreme Court has ruled that the power assigned to each branch must remain with that branch, and may be expressed only by that branch. Ginsburg, Douglas H. "Essays on Article I: Legislative Vesting Clause" Ergo, in each instance the courts willfully violated the Constitution by assuming the legislative role which is exclusively vested in Congress. Left Wing Judicial Activists: The radical judges meting out their biased version of justice halting Trump's Executive Order in blatant violation of the Constitution are neither rogue nor have the 'God-like' status as they perceive themselves because of their black robes. In fact, they are among the repulsive group of arrogant, radical left wing activist jurists that flourished and became mainstream under Obama who routinely trashed the U.S. Constitution as a matter of course. The judiciary's role and rule of law as specifically set forth in the Constitution are of total indifference to them. Rather, the Constitution is trumped by self-serving decisions cleverly underpinned by Marxist political correctness consistently subordinating America's best interests to minorities. Such judges masquerade behind black robes feigning judicial neutrality while using their powerful positions to propagate personal agendas, the law notwithstanding. Marxism: I know a tie-in to Marxism and political correctness sounds absurd but please bear with me and it will make perfect sense. For the sake of brevity, Cultural Marxism was conceived in Frankfurt Germany, circa 1921. It soon supplanted Karl Marx's failed Economic Marxism and became modern day Marxism. Its goal has always been to annihilate traditional Western culture and values through a peaceful, indefensible cultural revolution then supplant them with Marxist ideology. Focus turned to America in the early 1930s. Political Correctness: While the use and meaning of 'politically correct' run the gamut today, it is not about tolerance and diversity as proponents espouse. Early Marxists developed political correctness as a critical component in achieving their cultural revolution. Political correctness is a deceptive term for progressivism and multiculturalism; both are euphemisms for Marxism cleverly used to conceal the true ideology. Ergo, political correctness is Marxism. The radical judges halting Trump's temporary ban are included in the foregoing groups by virtue of their intentional unconstitutional rulings. However, the consequences of their decisions are far more dangerous than the others because they can directly affect the national security of our country, if only temporarily, as they have willfully done in this instance. The Judiciary-Marxist Nexus: Judges, like people working in other endeavors, acquire their education through academia. For years Marxist political correctness has dominated the academic curricula and spoon fed to students under the innocuous euphemism of progressivism. Disciplines traditionally taught have been subordinated to and in many instances replaced by mandatory classes in 'White Guilt' and various forms of minority supremacy. Therefore, it logically follows that one being indoctrinated with Marxist ideology through the academic years can absorb, believe, and adopt it through life regardless of their specific field of endeavor. Judges are no exception and this is clearly manifested in decisions of 'progressives' based on personal ideology instead of law who bought into and propagate Marxism as evinced in the Trump decisions. Trump's Perseverance: No president in U.S. history has been subjected to and endured the incessant vicious ad hominem attacks, congressional and judicial interference, and other deterrents maliciously intended to prevent him from performing his job. Not surprisingly, despite massive resistance, to his credit he is moving forward at warp speed and Making America Great Again. Decent Americans that love our country are extremely fortunate to have a man of Trump's character, intelligence, and dedication to her as President. As an aside, one of the most egregious examples of judicial activism was when Obama's punk Supreme Court Chief Justice John Roberts legislated and helped his pal by re-writing Obama Care twice to make it legal. We know the results of that expensive fraud thanks to Roberts. The late honorable astute Justice Scalia ripped Obama's boy Roberts in a scathing dissent you can read Here. You are correct in my opinion on all points. Judicial overreach: can it be ignored by President Trump? Does that depend on Homeland Security's support of POTUS? It is my knee jerk reaction, but logistically can it be done? Very enlightening! I am looking forward to more. AMERICA has to return to the way of conservative values and leadership. Our way of life is in danger. Trump was completely right in his actions.When this judgment is all over congress needs to bring these judges in for an impeachment proceedings. They have over reached their office and failed to honer their oath.